It’s no secret that many of us love high cholesterol foods: fatty meat, rich cheeses and creamy sauces all come to mind. But most of us are also aware of the dangers of boosting our LDL cholesterol too much: we up our risk for heart disease. Now here’s an interesting study you might be glad to hear about. Israeli researchers have found a way to make a diet high in cholesterol less threatening to your health. They conducted an animal study in which they compared the liver and aorta changes in rats fed cholesterol-containing diets. Then they looked for possible improvements when the cholesterol diets were supplemented with raw vegetables. The researchers took careful measurements of the phenolic compounds of three vegetables in particular: garlic; white onion; and red onions. They checked these vegetables for polyphenols, flavonoids, quercetin, flavanols, tannins, and ascorbic acid. They found good evidence for the phenolic contents and the radical-scavenging capacities of the three vegetables. The researchers then divided 30 rats into five groups. One group acted as control, the second group was given a cholesterol diet, the third a cholesterol diet combined with garlic, the fourth a cholesterol/red onion diet, and the fifth a cholesterol/white onion diet. The research team found that livers of the rats fed the cholesterol diet without vegetables were in worse shape than those that acted as controls. However, they also found that significantly less negative changes in the liver could be seen in the group eating the cholesterol plus garlic diet. In conclusion, the research team noted that all the studied vegetables showed protective effects, but raw garlic supplemented with cholesterol-containing diets significantly prevented aorta and liver damage in rats. Something to think about the next time you indulge in a high-cholesterol meal. 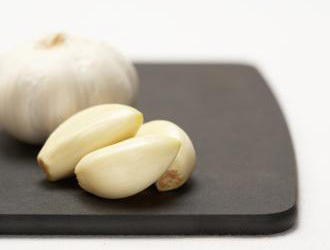 Add some garlic and you may be minimizing any health threats to your heart or liver. For more positive news about vegetables and cholesterol, read the article. Nine Ways Plants Could Help You Lower Cholesterol.